Win The Jungle Bunch: Let the kids show their true stripes | SWITCH. The fun and loveable Jungle Bunch, lead by Maurice, the Great Tiger-striped penguin warrior, help to maintain peace and order in the jungle. Based on the ABC's hit animation series, 'The Jungle Bunch', they come across their most dangerous opponent yet, Igor the koala, whose sole aim in life is to annihilate the whole jungle! To counter Igor’s evil masterplan, Maurice and friends team up with their mentors The Champions, the mysterious long-time defenders of the jungle. Along the way, we learn about Igor’s past, as well as Maurice’s origins and relationship with his mother, Natacha the tigress. The 'The Jungle Bunch' competition has now closed. Winners will be announced shortly. Competition opens at 5pm AEST on Sunday 15th April 2018 and closes at 11:59pm AEST on Sunday 22nd April 2018. Five winners will be chosen at random on Monday 23rd April 2018. To successfully win, entrants must fulfil the above entry conditions before the time the competition closes. Current members/followers are eligible to enter the competition. Only one entry per person. Only one winner per household. To be a valid winner, the entrant must not have won a prize from SWITCH within the last 28 days. Each winner will receive one DVD copy of 'The Jungle Bunch'. By entering, you agree to receive occasional emails from SWITCH in the future. If you decide to unsubscribe from these updates, any further entries will not be applicable. Only Australian residents are eligible to enter. 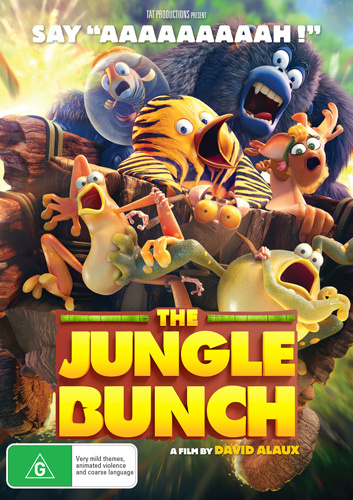 'The Jungle Bunch' is available on Digital and DVD on Wednesday the 18th April 2018 from Icon.